The last few days have been very strange without Wilma. I am not use to being home alone as she was my little shadow. Time will heal and remind us of the many many happy memories. I have been talking to many people who were involved with Wilma and everybody is of the opinion that she had 7 happy years with us and I believe it too. We had 7 incredible years with her and will know when the right dog comes along! We will not try and replace Wilma, we couldn't. Yesterday we buried Wilma in the garden. We chose a spot, behind the hedge we see from the kitchen patio doors, adjacent to where Max's ashes are scattered. Ofcourse it had to be the most deceiving plot of land we could have chosen. Although the earth was soft due to the rain the green turf hid a mightly collection of rocks, bricks and large pebbles. We started digging, Jon sweating as his spade bashed against yet more stones, I shovelled the earth away and be both cleared away the stones and made two heaps, one of soil the other of the stones. When we had dug down a sufficient amount we stopped and put our spades to one side. Jon carried Wilma out and carefully, lovingly placed her into the space. 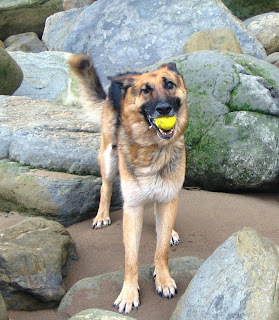 We packed the stones around her and I was particularly careful to pack her newly pinned hip to support it as she prepared to run and play on her next beach. I placed her favourite ball next to her, together with an apple, so the seeds of autumn one day may take root. We said our few words and then we threw some soil over the stones and packed the space safely allowing Wilma to be comfortable. She is facing the field where the horses run freely, just as Wilma will one day! It was a hard task yet one which we both had to do. It was appropriate that Wilma remained at home. There will never be another Wilma and I do not want to try and even find one. For now I want time to heal, space to think and time to remember! No more troubled moments or fear of others for our brave little soldier who died in her sleep early morning. The one picture I can not get out of my mind is of her yesterday, huge stitches on her head, massive shaven leg and pelvis walking tentatively around the house using her arthritic leg as the main one, allowing the pinned hip to rest. Even when she was lying down it was just as the vet had said he would want. Last night after her tea Wilma wanted to go outside to eat grass. At one point she was lying between the greenhouse and the shed. She came into the house but was obviously unsettled. She dozed off and I did too. I awoke at 3.30 and she had died in her sleep! 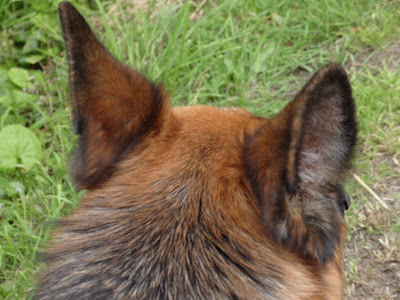 We had to go to the vets at 3.30pm Thursday to discuss Wilma's condition with the vet. 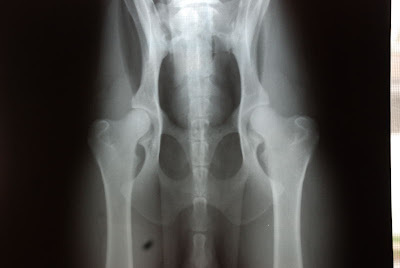 The x-ray he showed us showed the pin which had been inserted on Wilma's right hip and the arthritic left hip. We have to ensure Wilma does not jump up and displace the pinned hip in any way so the next 4 weeks are to be a time of complete rest for Wilma. What she shouldn't do is to put all her weight on the newly pinned hip. In order for Wilma to receive the rest and peace she needs we are on 24/7 care. We will not be leaving her, one of us will be with her all of the time, sleeping downstairsso she does not try and climb the stairs. 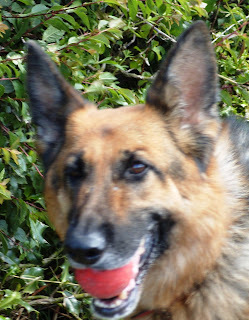 Wilma is also on a number of pain killers, anti-biotics and sedatives. We let her out to have a twinkle last night and were really pleased to see her walking in a way which the vet wanted to see. We are so so proud of our little fighter! Wilma has a dislocated one hip, apparantly the other one is arthritic, well for a dog with arthritis (which we did not know) I think she does remarkably well. One of her ankles? is broken too. These injuries although serious are not as bad as things could have been or as I was imagining. Wilma suffered an almighty gash to her head exposing part of her skull, and when her nose was bleeding we were fearing internal bleeding or even brain injury. He did pose the question......but Jon pointed out quite rightly we owe it to Wilma to have the hip put back and for the necessary surgery to be carried out so we can have her home where she will be looked after 24/7. Wilma does not like to be any other place and will be very very nervous and worried, so the sooner she is home the better. At lunchtime today I went to collect the gazette from the wall, just along from our house. Wilma stopped in our drive, but when I checked that the village nuisance dog was not about I signalled for her to come with me for the few yards. Unfortunately the nuisance dog in question was laying hidden from us, so as we passed it bolted, strtled Wilma who ran after it, over the road. I shouted Wilma and she returned, faithful as she is, running towards me....at the same time as a car, not doing 30 mph sped into view, hurtling Wilma a few feet up the road. Her cries were blood curdling and so so obvious an indication of her pain, shock and anguish. We lifted her into the back of the van and sped off to the vets, where she remains. Sedated, on a drip and having helpful drugs administered. She needs our thoughts right now, so much appreciated. To say the least really, life is so busy! Back in a while, probably next week when the big event of Yorkshire will have been and gone and the Wedding Fayre of the year will be about to happen! Nesting Box 1 last Night! 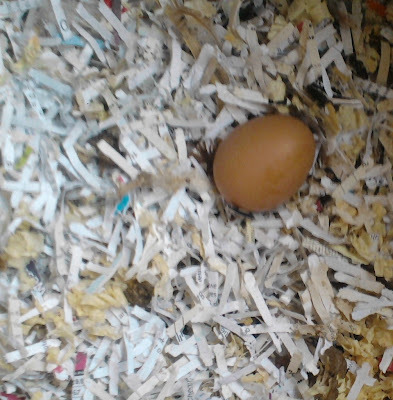 When I went to clean out the henhouse last night I discovered the very first egg the girls had delivered for us. I am not sure who was responsible but I have a suspision it is May. We did not eat it, though tepmpted, we marked it and left it in the nesting box to encourage the others to lay some more! The hens are definately showing their personalities now. First on the scene, front of the queue is always Little Eva followed by May. The two dominent ones tend to be Mabel and Olwyn. When I am putting them in for the night it is Mabel who would sleep in the tree if given half a chance. They both stretch their necks towards the tree when going in for the evening and I wonder if they are casing the joint for future escape plans! Margie and Bev are always the first into the henhouse and seem to be the most placid. We are very happy with the way they are all getting along! Their favourite snack has to be the elderberries and the wind fallen apples...which reminds me, I must sort out the apples and EVERYTHING else on my list. Trouble is, we are very busy with Jon's business right now and tomorrow we are off to Sunderland for 3 meetings. Thursday I have 2 meetings, again for Jon's business and we are both off to Huddersfield on Friday, again 3 more meetings. STILL! I am not complaining! Anybody who is business and moans about being busy is quite frankly in the wrong job! Business is all about being busy! Infact I would bet on the fact that busy is a root word of business! What do you think? Today we lit the Aga, a sure sign that summer has well and truly passed and time to accept that Autumn is here. Although the sun is shining there is a definate nip in the air and night times are particularly cold. We went out on the motorbike today, initially to Whitby for lunch we both commented how cooler everything seemed to be and given the choice of riding over to pickering or returning home to light the Aga, we chose the second! And so........there are jobs to be done as we get ready to prepare the garden for it's annual sleep! 2 apple trees need harvesting so the chutney recipes will be coming out! We are planning a wonderful pie & peas evening for when our friends Dorothy and Keith visit in December, so as they are both fans of my chutneys I will make sure they are not disappointed. I also plan to pickle some onions and make some picallilli! Mmmmmmmmmmmm hungry all ready! The henhouse although adequate right now needs to be replaced by an improved warmer one, so the shed next to the henhouse needs sorting. The broken windows need replacing and some additional bits and bobs need dealing with. The hen's enclosure needs further securing as I have noticed Little Eva has found a way out a couple of times! We have some wooden floorboards left over from the stable demolition which need chopping up into sticks for firewood. Ofcourse one major change will be the clothes I wear. Good warm practical stuff is required for the coming months and my faithful boots will be once again strutting their stuff! This will keep me busy as well as the other activities which make up our everyday life here in the Nesbitt household. Wilma needs her daily extensive walk too! There is so much to be done and not having my laptop for a few days has not helped. I have just realised how much information, images and templates I keep on it which doesn't help when I have stuff to organise. In 2 weeks time I am attending a Trade Fayre re Jon's business and need to organise a stand.I am trying to find some sort of stand via various agencies. Te local council were particularly unhelpful and I must admit I lost my patience somewhat, pointing out that in the current financial climate they should be helping to promote local businesses, especially in the manufacturing sector! The council mentioned funding but again this is not the answer. I do not want to submit a business plan for their perusal so that 6 months down the bureaucratic route we get some money to buy an exhibition stand we will probably never use again and by which time we will have no need for as the exhibition will have long gone! And there is a brochure to write.....I could go on but I wont, instead here is my Flash 55 for Friday......enjoy it! I certainly do! She had acted quickly but had it been quickly enough? “I saw you!” he whispered! She returned the last Rollo!